You can’t get much more American than Washington, D.C. I was not born or raised here in Washington, but my first job out of college was here. I’ve then met the love of my life, had two beautiful children, and have been here since the day I moved here. A tradition of my family is to see how they decorate the White House every year. Getting inside to see everything isn’t always easy. Great thing is the internet can show professional photos of the places we would never see on a tour. This is year is the first year wreaths have been placed in the windows outside the White House. I’m going to take a wild guess and say this will probably be an ongoing tradition in the years to come. The White House has a holiday makeover, and with most makeovers, we like the change. Now, it’s the interior that gives inspiration of what to do in our own home. What will the Presidential family come up with this year. What designs have been created? It could be generic and boring, but not the case. This year blew my mind. This year is a “wow”! What They’ve Created This Year! Wow, right?! This is fit for a palace. They had me at 53 trees. That is like half of the Christmas Tree Lot down the road from my house. I could fit maybe 4 trees in my house if I really tried. I’m more of a traditional one tree person, and I bought artificial trees in both white and green, so we can put one upstairs and one downstairs every year. After going through our top picks for our home decorating we all fell in love with this one photo from the White House. This is the inspiration for our home this year. The white lights, the blue backgrounds, the frosting below the trees. The funny thing is they look like white trees, but these are green. So, one tree down, and we know the colors to decorate in the room around. 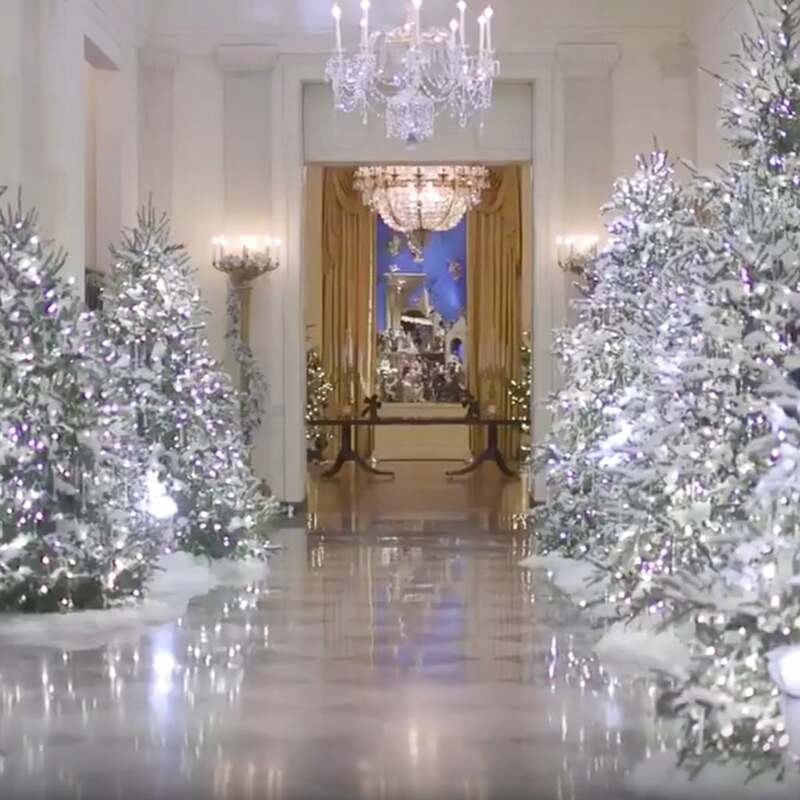 We don’t have 18,00 lights or 12,000 ornaments, but we also don’t house the leader of the free-world. Though I think I work pretty hard. Our next inspiration is the picture below. Creating the Christmas Present Box to place the stand in was easier than I thought. I’ve used an old crate from my basement that the stand fit in. Now, our creation will be the white tree, but the red and white decorations are so easy to come by. There are so many other inspirations that come from all the rooms of the White House. If I had to guess there are probably thousands of photos of the rooms in the White House right now. And when it come to your inspiration for your family’s home this year, it doesn’t have to be the White House, it’s just a great way to be inspired. My father was a U.S. Marine, and so was my grandfather. Both went to war to protect our country. Even though I never went into the Marines I always felt I should stand behind my country. This is just something simple I do because I grew up this way. American, or not, I wish all of you a Very Happy Holidays. Please be safe and enjoy your time with your families.